Milk paint was developed by the gang from General Finishes for many uses - from a clear, bright contemporary look to old fashioned painted furniture with a good range of color that could be extended by the user. Not a true "milk paint" but a high tech acrylic product, it is fabulously adaptable & UV resistant. Milk Paint can be used indoors or out & applied to furniture, crafts, and cabinets. Easy to use - consumers can hand apply or professionals may spray. It is the furniture paint with soul. You can mix it, lighten it, distress it, glaze it, layer different colors, antique it - perfect for upcycling or repurposing furniture. Available in 28 mixable colors. Milk paint is the stocked version of General Finishes custom color paint line. Follow with General Finishes glaze effects for a distressed or antiqued look. 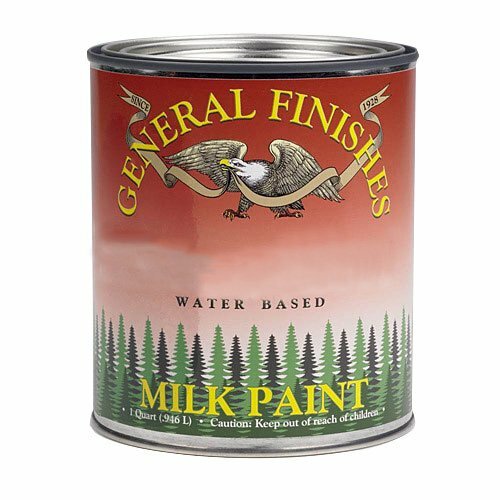 General Finishes milk paints will adhere to a variety of surfaces including wood, fiberglass, PVC, vinyl, and most composite materials. Additionally, these paints can be applied over existing finishes, stains and other paints so long as the existing finish is fully dry. However, when painting over other finishes, it’s important to always test a small area first to make sure the paint adheres well to the original surface. First, use a scotch brite pad and a 50/50 mix of water and denatured alcohol to clean the item you’ll be painting. This will remove any grease, oil or residue on the existing finished surface. Once you’re done scrubbing it down, wipe it dry with a rag or paper towel. Next, let the solvent flash off for about about 1 to 2 hours and then sand the piece with a soft sanding sponge or 400 paper. In terms of using primer, General Finishes Milk Paints are self sealing, so you do not need to use a primer. You may use a stain blocking primer if you need to seal knots, or are covering grain, dark, or red colors (reds tend to bleed). You may also use a stain blocking primer if you’re painting light or white, or if you’re painting a wood that is known to bleed like pine or oak. If you’re applying a water-base primer first, follow the primer directions and let the primer fully dry. Then, sand the primer with 180-220 grit paper before applying your milk paint. Do not use a primer if you are sanding down to bare wood and glazing as you will see the primer. First off, fill any holes you may have in your piece before painting using putty that dries hard and can be sanded down. Then, test the color on the underside of your project to make sure it’s exactly what you want. Sand down the wood surface in the direction of the wood’s grain. Start by using 120 sand paper and then move up to 220. Next, stir your paint thoroughly. If the paint is a little thick and won’t lay flat without brush marks, add a small amount of water and stir well until it thins out. Using an acrylic bristle brush, poly foam brush, Handi Painter Applicators or an HVLP 2.0 needle, paint on a generous first coat of milk paint and make it as solid as possible. Let the paint dry 2 to 4 hours between each coat. Also, sand or buff between coats of milk paint using 320 to 400 sandpaper or soft backed sanding sponges. Note: sanding is not needed for adhesion, only for smoothness. Once you’re done sanding, remove the dust. Applying a second coat of milk paint will provide a strong, solid base and leave a solid paint across the surface. Again, after applying the coat, let the paint dry another 2 to 4 hours. Normally, 2 coats is sufficient for a solid paint. When applying white or light colors or going over dark woods, a 3rd may be necessary. Milk Paints dry to a somewhat low luster sheen. To counteract this, apply 2 coats of any GF water base clear top coats over your milk paint to increase the durability, alter the sheen and make the paint generally easier to clean. Be sure to use Poly Acrylic or High Performance General Finishes top coat as both are water white and will add no color to the paint. If you’re looking for a more amber-oil look, however, use Enduro-Var water base. If you’re using General Finishes for exterior surfaces, apply 3 coats of the milk paint and let each coat dry for 2 to 4 hours in between. Milk paint can be used alone, or you can apply Exterior 450 top coat if you’d like to change the sheen of the paint. However, be sure to allow 3 to 5 days before moving the project outdoors.